The USGS uses continuous monitor data to assess nutrient and suspended-sediment loading on monthly, daily, and hourly time scales in the Upper Klamath River Basin. This study used commonly measured data related to the scattering of light from particles suspended in the water, combined with statistical methods to convert the data into concentrations and loads of sediment and phosphorus for the main tributaries to Upper Klamath Lake, the Wood and Williamson Rivers. A 2002 total maximum daily load (TMDL) standard for Upper Klamath Lake targeted a 40 percent reduction in external total phosphorus loads to help moderate the dense algal blooms that occur during summer. Poor water quality that results from the growth and decay cycles of the algal biomass likely has negative impacts on two endangered suckers in the lake. Near real-time monitoring of total phosphorus and suspended-sediment on the two main tributaries using techniques reported in this study along with ongoing monitoring efforts will help determine whether the targeted reductions are being reached through the combined effort of restoration projects in the upper Klamath Basin. Long-term datasets will be necessary to assess the inter-annual variability of total phosphorus and suspended-sediment loads. The application of surrogate techniques described in the recent report, and in ongoing near real-time monitoring, provides a useful tool to assess this variability, while simultaneously reporting model uncertainties. 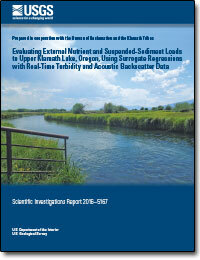 Results from the study highlight the usefulness of surrogate techniques to assess loading to Upper Klamath Lake and the ability to report loads and model uncertainties in near real-time, a technique that is currently employed to display suspended sediment concentrations and loads from the Williamson River. To view a graph showing estimated suspended sediment concentrations computed using this technique, go to this link. These same techniques have recently been applied to the Sprague River, a tributary to the Williamson River, where suspended-sediment concentrations and loads are also being reported in near real-time.